To avoid disappointment, we went to purchase the last release of the Strawberry Shortcake's friend, the Orange Blossom, on last Saturday. This time we just bought the toy figurine without having the Happy Meal. 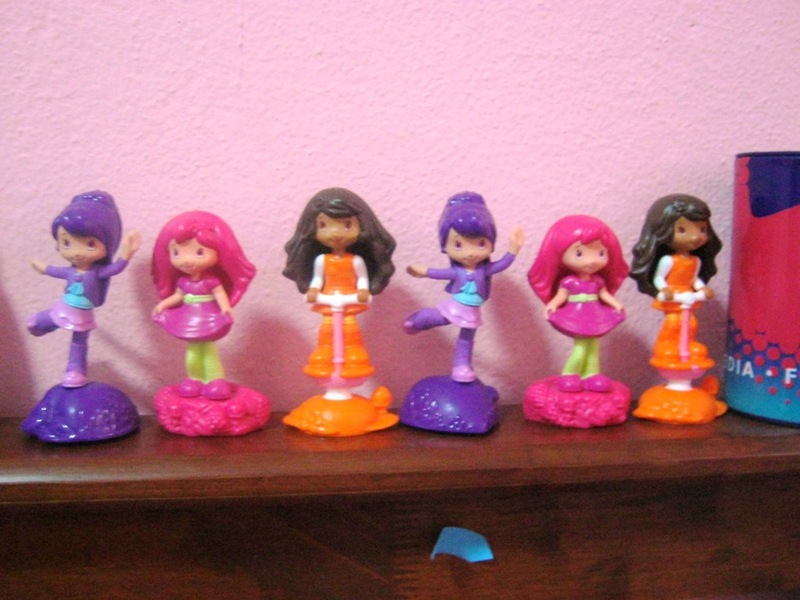 That's made the collection with only Strawberry Shortcake's Friends without the Strawberry Shortcake herself.*sigh*. Clet has asked for his friend's help, whose wife is working with McDonald, to get hold of the Strawberry Shortcake figurine but unfortunately there is no stock left. These figurines are so adorable, of course it would be nicer if we have the complete set of them as collection. At the moment they are placed on our girls' bed head frame like this. We shall watch out for the next McDonald's Happy Meal collections to add on to our girls' collections. wah so nice and colourful. but there are 2 sets there right?